I've noticed one thing this winter/holiday season and that is that teddy bear, fuzzy coats are having a huge moment. I for one, am all for this trend because I think these coats look very chic and fashionable but not over the top. Anyone can pull off one of these coats and to me, they dress up any outfit. You can wear a fuzzy, cozy coat with sweats and sneakers but it'll look like street style. These coats also feel super fancy and can enhance a very dressy outfit. I have a white fuzzy/furry coat that I got at J.Crew Factory last year (it's no longer available) and I get so many compliments on it! It makes me feel so put together and is just the perfect touch to any outfit. I wore my coat to my birthday brunch over the weekend! Here's a saved Instagram story! I love these coats so much and I want to try to add at least one more (maybe a leopard one?) to my collection before the season ends! Below are a few that I rounded up, mostly under $200! PS: The leopard one from Target is to DIE FOR! 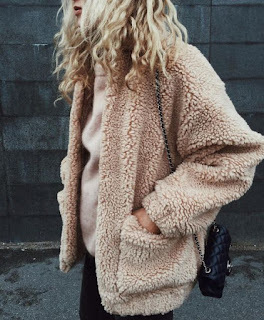 What are your thoughts on these fuzzy coat trends?